Supplies: Men's tshirt or large tshirt. 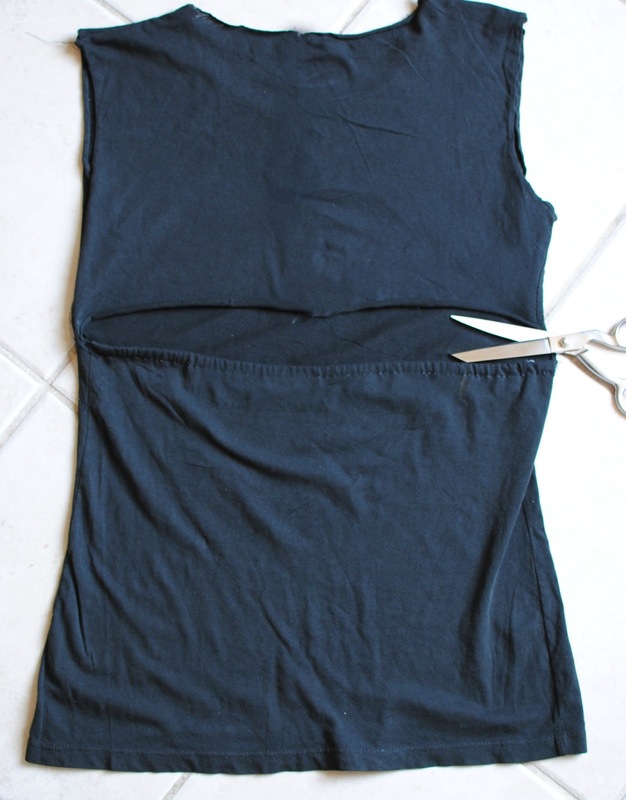 Remove sleeves and collar if you want. Cut about 4 inches down from the armhole of the back. The lower you go the more you show. Fold over the bottom half and sew. You will need to cut a little slit to fold over. Make sure it's wide enough to pull the elastic through. Thread the elastic through with a safety pin. You will need a slit on the inside to pull it through. Secure the elastic by top stitching the ends. The elastic should be the length of your back. With the excess arm fabric, loop around the cinched area and secure by topstitching. I used the sleeve seam. Easily worn as a dress or top. Looks good with a bandeau or racerback sports bra. love it, thanks 4 sharing!! Nice project! Simple and brilliant, just like I want. the dress is perfect for holidays!